When it comes to collecting pallets for recycling, the accurate identification and sorting of incoming pallets are crucial. Some types of pallets have more value than others, while some company branded pallets, including rental pallets, must be made available for return to their owners. Unauthorized possession of proprietary pallets can leave the pallet collector facing legal exposure. This photo guide shows some basic types of pallets that the recycler can expect to encounter in the course of daily operations. Let's take a closer look. The most popular pallet sizes or footprints are shown in the table above, starting with the dominant size, the 48x40-inch. Keep in mind, however, that this list is based on research now over 15 years old. The 48x40 GMA-style pallet has been the most significant size handled by the pallet recycling industry, and in fact, the most popular footprint for overall pallet usage in the U.S., accounting for over 30% of U.S. pallet production. Other major sizes listed above, however, are also often refurbished and accumulated for resale depending upon local supply and demand. Examples include the 48x48 drum pallet, 40x40 dairy pallet, and the 36x36 beverage pallet. The GMA-style pallet has been critical in the highly palletized U.S. consumer products industry, although its usage has been reduced by the acceptance of higher quality 48x40-inch rental pallets offered by providers such as CHEP, PECO, and iGPS. Larger sized pallets can be useful for repairing or building custom smaller pallets out of recycled wood. Longer pieces can be recovered from disassembled pallets and trimmed to the desired length. 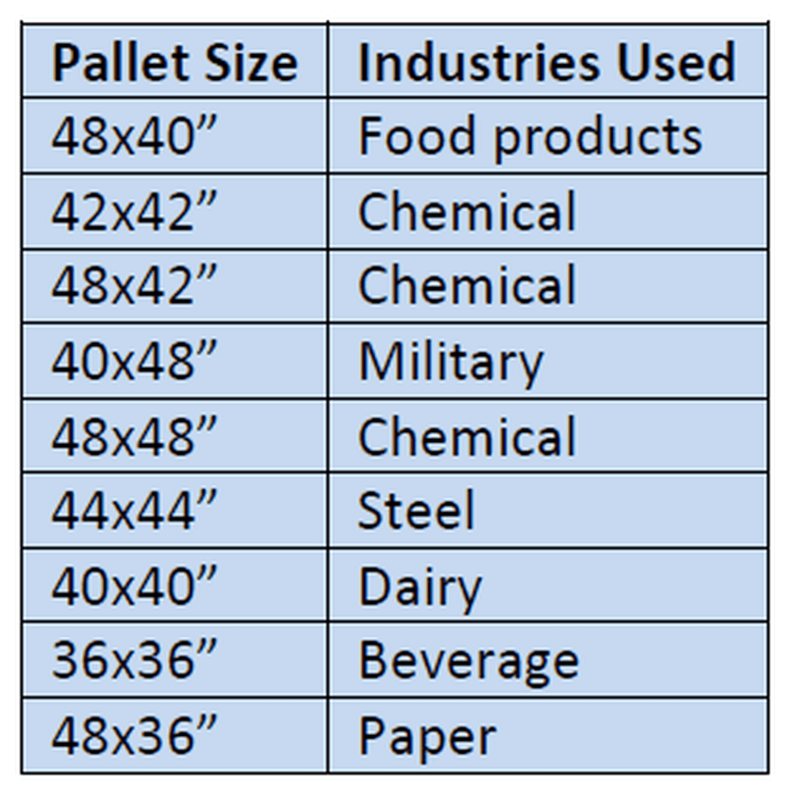 In addition to sorting by size, pallet recyclers may have several different categories based on deck board thickness, pallet type, as well as by condition or type of damage, in order to improve the efficiency of their repair operations. Pallets with too much damage or of unpopular sizes are often dismantled for lumber recovery. Unusable wood is shredded and sold into a number of markets. CHEP pallets remain the property of CHEP, and must be made available for return to them. As such, pallet recyclers typically take one of two approaches. The first is to refuse receipt of CHEP pallets. For example, where a recycler is buying pallets from street vendors or pallet collectors, they may refuse to accept CHEP pallets, or at a minimum, refuse to compensate pallet collectors for them. It is not always possible to eliminate the flow of inbound CHEP pallets into the recycler's yard, however. For example, van trailers dropped at a distribution center may come back with a load of pallets that includes some CHEP pallets as well. As CHEP pallets accumulate, recyclers must make arrangements with CHEP to have them picked up or to deliver them back to the CHEP depot. CHEP has a program to compensate recyclers for the expense of stockpiling and returning its pallets. Plastic pallets come in a variety of sizes and shapes. Also, some may be branded with owner information. One example of a proprietary pallet which must be returned is the U.S. Postal Service pallet. Many plastic pallets are proprietary, and remain the property of their owners, even if left outside. For other plastic pallets, however, markets may exist for them. They are valued for export purposes as they are ISPM-15 exempt for international shipment. Markets for used plastic pallets exist, however, the availability of inexpensive new plastic export pallets limits the price of used plastic pallets in the market. Another type of pallet come across by recyclers is the presswood pallet. These nestable pallets are also ISPM-15 exempt and are more rigid than many plastic pallets. If volumes permit, they can be accumulated and resold. The U.S. manufacturer, Litco International, also has a buy-back program that might be an option to the recycler. Litco offers its pallets in the U.S, as well as internationally. Like CHEP pallets, plastic iGPS pallets are proprietary rental pallets. Arrangements must be made to return them to iGPS. Unlike CHEP pallets, which typically accumulate at pallet recyclers, iGPS pallets additionally accumulate at plastic recyclers as well. iGPS has deployed GPS chips in some of its pallets so it can trace them when they leak out of their network. The company says that its technology has assisted it in leading authorities to stockpiles of its pallets at unauthorized locations, as was the situation in one apprehension. iGPS states that it is interested in working collaboratively with retailers.